Exciting. Beautiful. Adventurous. Safe. Friendly. Foodie haven. These are just some of the wonderful adjectives people have used to describe Vancouver BC. Ranked in the top ten of the world’s most livable cities, Vancouver is a lively seaport on the west coast of British Columbia. Dubbed the Manhattan with mountains, Vancouver BC beautifully blends the stimulation of urban life with the splendor of nature. However, this densely populated and ethnically diverse city is actually quite young. Although home to First Nations people for 10,000 years, the American, European and Chinese settlers didn’t inhabit the land until around the Gold Rush in the 1860’s, and Vancouver wasn’t even incorporated until 1886! Now, it is a thriving scenic metropolis that attracts millions of tourists each year, including us. 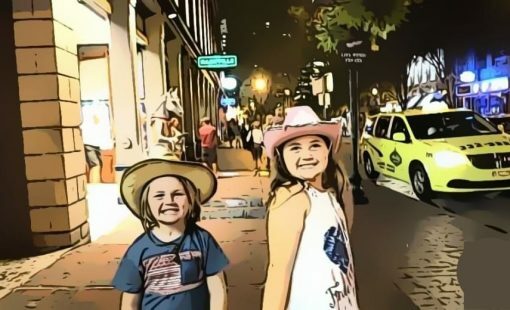 We actually had the opportunity to spend a few days exploring Vancouver with kids before embarking on a Disney Wonder Cruise along the California Coast in September. It was a bit rainy but we had a great time and learned a lot about the city. 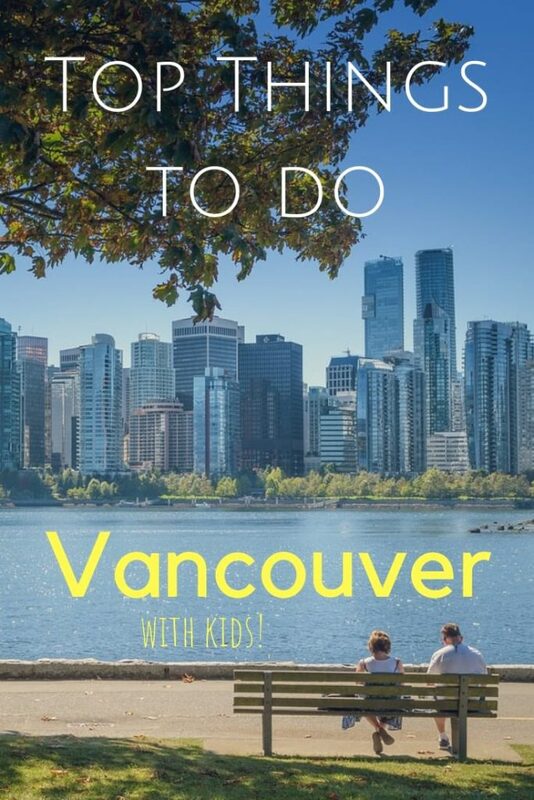 Here is our list of the top family activities in Vancouver. Vancouver is filled with lively downtown neighborhoods, tranquil beaches and mountain adventures. 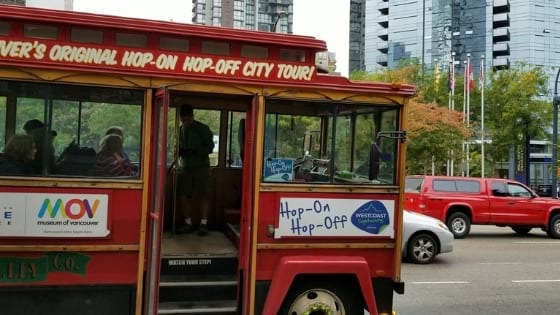 With so many things to do in Vancouver, I recommend catching the Westcoast Sightseeing Vancouver hop on hop off bus. With both city and park routes, it is possible to see ALL of the best Vancouver attractions in a day or two. I personally love these kinds of buses, because they really give you a good lay of the land when visiting a city for the first time. We spent our first day with kids in Vancouver traversing the city on the Westcoast hop on hop off bus and it definitely helped us to get our bearings for the rest of the trip and was a pretty comfortable ride. 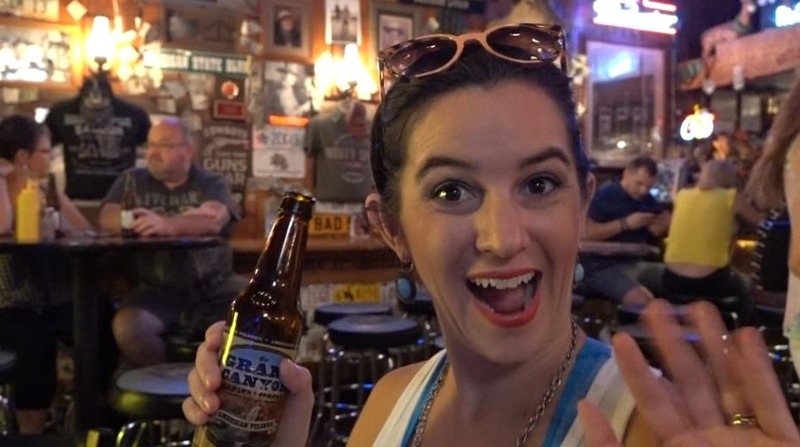 Let’s start where it all began…with a tavern (like most great cities!). Yes, a whole city materialized thanks to one man and his saloon. 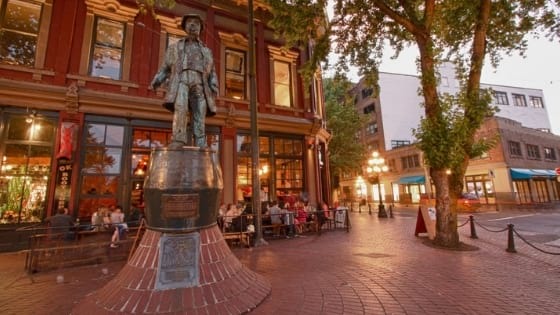 Gastown is Vancouver’s oldest neighborhoods, founded in 1867 when a man by the name John “Gassy Jack” Deighton opened up the areas first tavern. With that other businesses started to pop up and the town continued to grow. It doesn’t sound like the most obvious of things to do in Vancouver B.C with kids, but today Gastown is a national historic site and hub for great shopping, dining and nightlife. Featuring Victorian architecture, tree lined streets, twinkle lights and the famous Gastown Steam Clock, this part of downtown is very charming and one of our favorite neighborhoods to just hang out in. 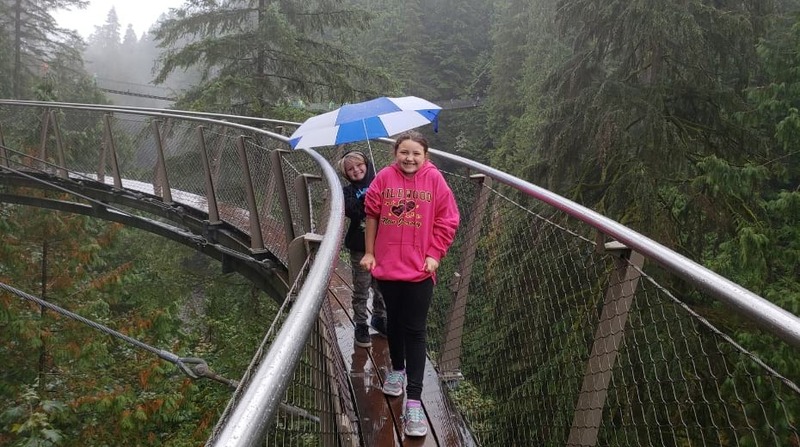 One of the coolest things to do in Vancouver with kids is spending the day at Capilano Suspension Bridge Park. 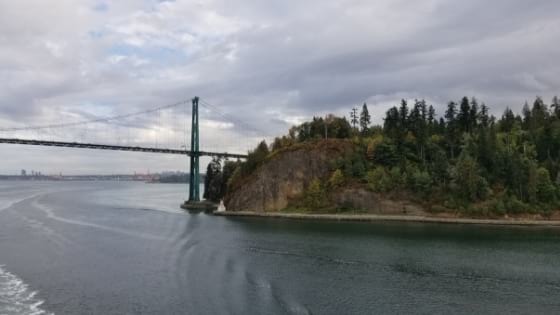 Established in the late 19th century, visitors get to explore wilds of Vancouver via suspension bridge, Treetop Adventure, Nature’s Edge and the harrowing Cliff Walk. It is not only fun, but educational. 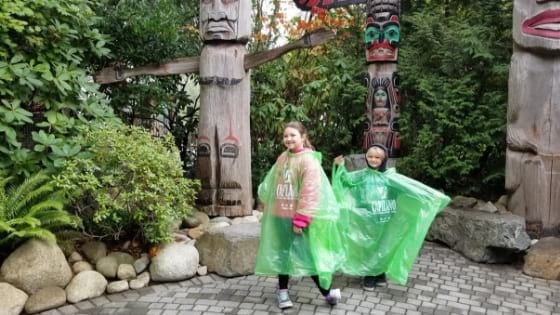 Your family can stroll through Kia’palano, taking in the towering totems and learning about the First Nations People before venturing off into the Vancouver rain forest. There are also places to grab something eat and drink, because we know that all that adventure can work up an appetite. I recommend taking a well deserved break at the Cliff House Restaurant. It has a warm and cozy atmosphere, delicious food and cold beer on draft. Rain or shine, this park is perfect for the family day out in Vancouver. We visited on our recent trip to Vancouver and it ended up being a huge highlight of the trip. 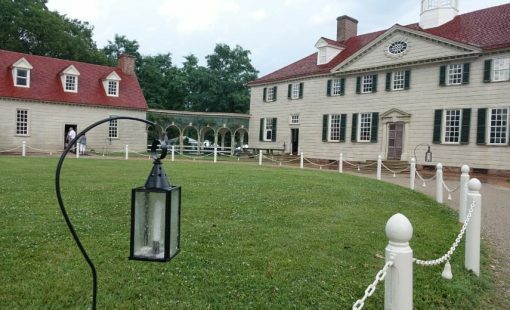 You can read more about the history and how to plan your visit with our detailed post, HERE. Stanley Park is a beautiful and lively 1,000 acre public park surrounded by the Vancouver Harbor. Originally inhabited over 3,000 years ago by the indigenous people, this was the first area of Vancouver to be explored by settlers. What makes Stanley Park truly unique is that it is not a man-made creation, but rather a fusion of natural forest and urban development. In fact, the forest of Stanley Park is as dense as it was in the 19th century. The trees can stand up to 250ft tall and are hundreds of years old! 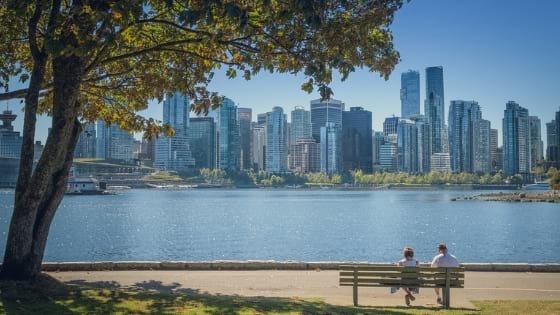 The surrounding Vancouver Seawall not only helps to prevent erosion, but also provides a scenic and popular trail for those who wish to get out and get active. Along the pathway you will find beaches, lakes, lots of trees, and other family things to do in Vancouver like playgrounds, Science World and the Vancouver Aquarium. 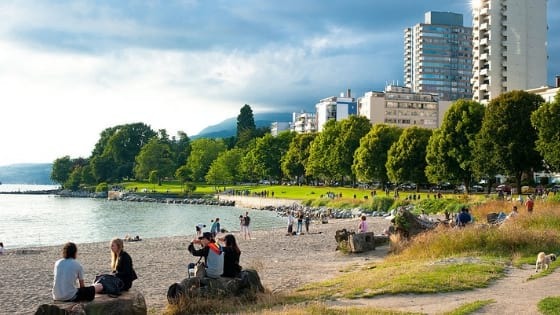 This is the most popular downtown Vancouver beach. The seawall that surrounds Stanley Park also encircles English Bay. The beach is a great spot of sunset-gazing, swimming and sunbathing. It is also the site of many events like the summer firework competition, the annual polar bear swim and Vancouver pride festival. Kitsilano is a cool residential area that was once Vancouver’s hippy hangout. Now, Kits is laid-back waterfront hub of restaurants, shops and parks. 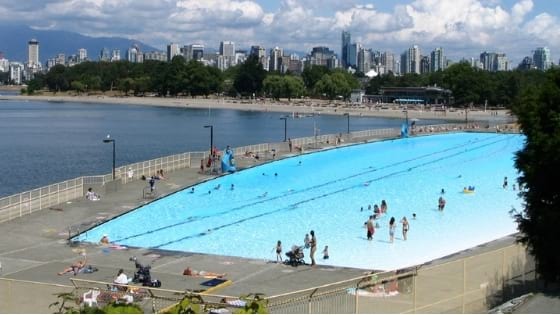 Take a dip in the huge saltwater Kitsilano pool on the beach while taking in the mountain views. 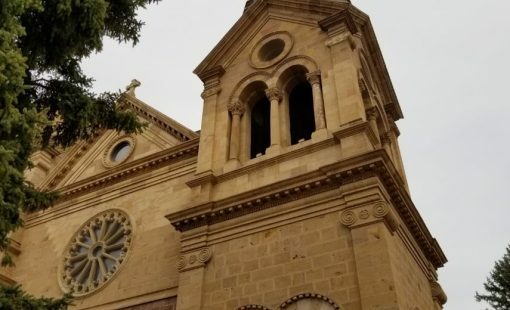 This neighborhood is also home to some of the oldest vegetarian restaurants in the city as well as a number of great seafood restaurants, organic farm-to-table options and Greek restaurants. Also in Kitsilano, is the Museum of Vancouver, H.R MacMillan Space Centre, and the Vancouver Maritime Museum. Technically, Granville Island is a peninsula under the Granville Street Bridge. What was once an industrial pit is now loaded with shops, a public market, dining options and entertainment. 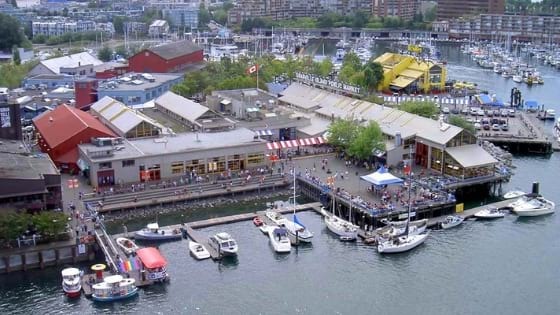 Granville Island is home to over 300 businesses, including over 50 independent food vendors and numerous artists and designers. 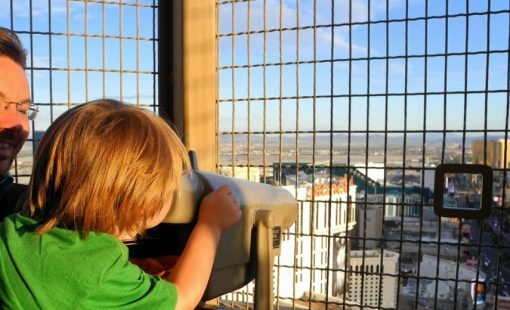 Mom and dad will love the breweries and unique grub, but kids will love visiting the Kids Market. The Kids Market is reminiscent of the big public market, expect the shops, dining options and activities are all geared towards kids. This is a lively and spirited place to walk around and enjoy the afternoon. 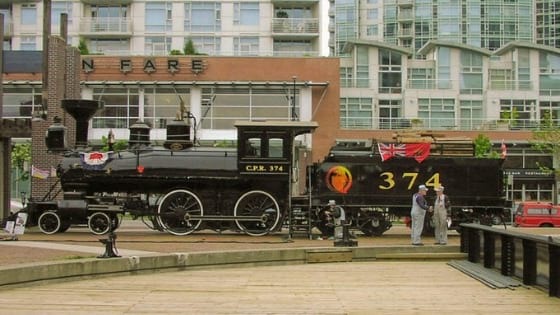 Now a hip urban district loaded with exciting restaurants and shops, Yaletown was once the western station for the Canadian Pacific Railway. You can still check out a piece of this neighborhood’s historical roots at the Roundhouse Community Centre with the display of Engine 374. In 1887, it was the first transcontinental train into the city! Now the brick warehouses and their exterior platforms have been transformed into trendy restaurants, pubs and lounges. This is a great place for a night out on the town and local fare at a unique Vancouver restaurant like the Flying Pig Yaletown. 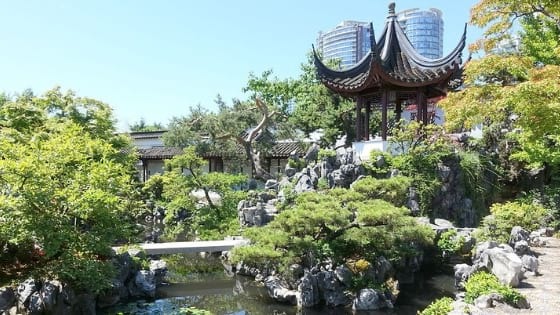 Located in the city’s historical Chinatown, this garden is the first of its kind to be built in Canada. It features a jade pond, koi fish, 150 year-old miniature trees and tai hu rock from China. The garden makes for a relaxing walk and city break for the family. The walk includes a scavenger hunt, making it fun for the kids too. I know it sounds weird, but here me out. Known as Canada’s plane, taking a scenic tour on a seaplane will really take your family vacation to Vancouver to another level. Visitors can choose anything from a 10 minute scenic flight to full day trips. 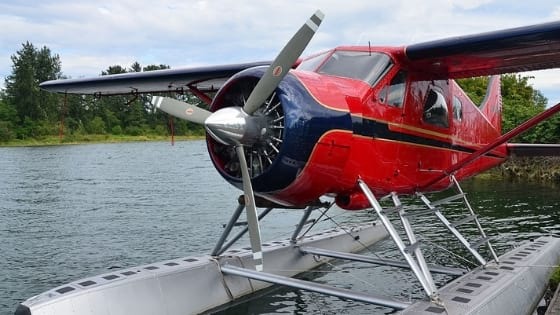 Imagine the excitement as you and your family feels the spray of ocean mist on your face as you take flight taking in the breathtaking views of British Columbia on a real seaplane! I would go back to Vancouver B.C just to eat. Honestly, everywhere we went had delicious fresh food. So, when in Vancouver bring your appetite. Plus, you all know how we feel about a good patio and almost every restaurant and pub had a fabulous outdoor seating area. Despite the rainy weather, most patios are designed to remain open year-round! Yippee! Honestly, the recommendations I could give are endless, but here are a few of our favorites. I am going to start with this restaurant, because it is a favorite of mine in the states and I had to compare it to home. As much as it pains my heart to admit it, the food was exceptionally better than any other Spaghetti Factory I have ever visited. I always get the classic – Mizithra cheese with browned butter – and it was eye-rolling amazing. I think what made the biggest difference was that all the ingredients were super fresh and locally sourced. 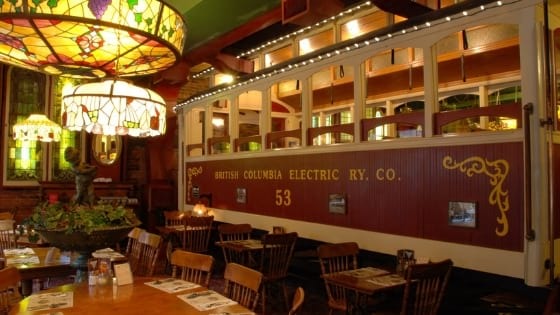 Prepare to have your mind blown (and tummys happy) at Old Spaghetti Factory in the heart of Gastown. This place was so good, we ate there twice! No, seriously. Located in the Century Plaza Hotel, this Italian steak house had wonderfully creative craft cocktails, homemade pasta and mouthwatering steak. Every meal we had was impeccable! 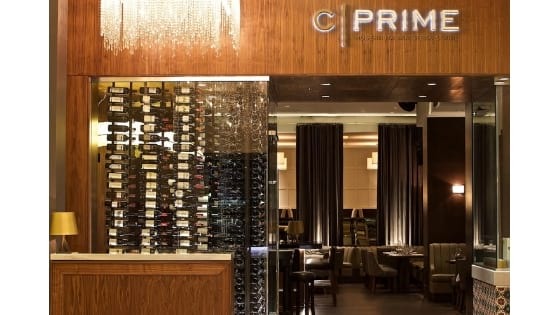 Since we were staying at the Century Plaza Hotel, C Prime was super convenient on our first night in town, and when weather struck on the third night, we were more than happy to eat there again. There is an extensive cocktail list featuring a host of classic Italian cocktails, but they also have some incredible creative signature cocktails. My husband ordered the Smoked Fig Old Fashioned and it was awesome. Although it actually smoked, it was not smoky if flavor. It was the best cocktail I’ve had in a while and I am a bartender! Okay, there are TON of amazing Japanese restaurants to try in Vancouver, but we are fans of Gyu-Kaku. The food always hits the spot, the atmosphere is fun and the prices are really reasonable. We sat along the open wall leading to the patio watching the cool rain as we sipped hot sake and slurped buttery ramen. It was warm, cozy and we loved every minute of it. This is the go to for a great breakfast or brunch in Vancouver. Much of the menu is Mediterranean inspired, but the café is best known for their exceptional Belgian Waffles. In fact, they have actually been called the best in the city. 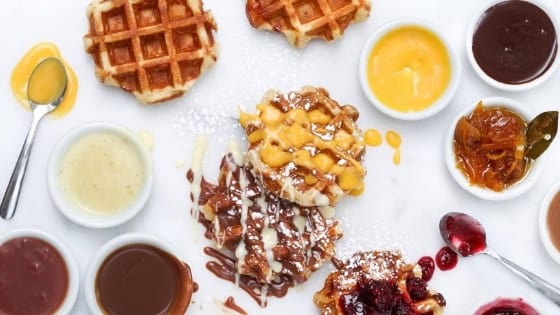 The waffles are made fresh daily and come with a variety of exciting topping. However, if you want to try these amazing waffles, get there early because supplies are limited! For more top picks, check out Vancouver is Awesome. So there you have it, if you follow this list I guarantee you will have an amazing time in Vancouver with kids. Here is what I love about visiting Vancouver with my family. 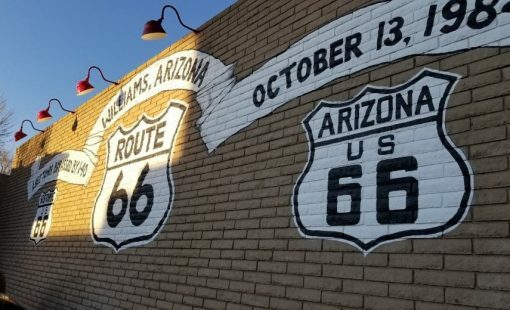 The food is amazing, the city is safe and clean and pretty easy to get around, and the proximity to natural beauty allows for endless outdoor adventures.